Wednesday evenings, 2 sessions vailable 3-5pm or 5-7pm. Come to one or join both. Each session is considered a separate class. Location is in the downstairs studio. Cost is $16 per session for members and $24 for non-members. 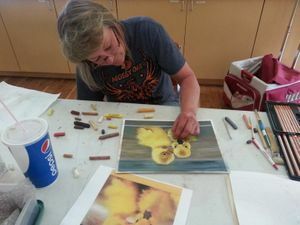 Instructor Becky Litke will discuss what elements to put in a painting, what to leave out, how to use photos as a reference, how to position subject matter on painting paper surface for the best visual impact.How to pck the proper size paper for the subject matter depicted. She will discus outlets for students to sell art, including local business, art in parks, the internet and local galleries. Also discussed, how to determined which pieces of art produced will have the best appeal to a large audience, therefore worth the investment to reporduce on note cards and prints. Becky has studied under several well known artists and instructros and is an active artist herself. She has been instructing watercolor classes at Crossroads for many years.